Hydrogen (H2) is the most abundant chemical substance in the universe. Stars are primarily composed of H2 in its plasma state. At standard temperature and pressure, the gaseous form of H2 is colorless, odorless, tasteless, non-toxic, and highly combustible. Hydrogen is the most abundant chemical element in the universe. This element is found in great abundance in stars and gas giant planets. Molecular clouds of H2 are associated with star formation. Hydrogen plays a vital role in powering stars. Some air-ships, such as the well-known Hindenburg utilized hydrogen as a buoyant gas. A limitation of using hydrogen for this purpose is its combustibility when mixed with oxygen in the correct proportion. Modern flight applications requiring buoyant gas now utilize Helium which is not combustible. Hydrogen gas forms explosive mixtures between 4-74% in air. It was burned with oxygen in the main engine of NASA’s Space Shuttle. Hydrogen has low density and does not add significant mass which can reduce payload on space vehicles. 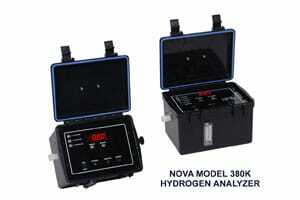 Hydrogen gas analysis is a critical strength in the Nova product line. Many of the industries and applications we work in require H2 analysis. The primary methodology of H2 analysis offered by Nova uses thermal-conductivity detection. Hydrogen has the highest thermal-conductivity value of all gases. This characteristic can be exploited in many cases to determine the amount of H2 that is present in a sample. Measuring H2 by a thermal-conductivity detector can be a challenge if the sample contains more than one other non-H2 gas. This is because each gas contributes its own thermal-conductivity value to the over-all thermal-conductivity value of the mixture. Isolating the H2 value under these conditions is difficult to do. To provide an accurate H2 analysis, we can analyze the other interfering gases by other methodologies and subtract the results from the thermal-conductivity results. This correction factor can be dynamically applied to help us to accurately measure the H2 in the mixture on a continuous basis. In many cases in industry, the gas mixture is some variant of oxygen, carbon monoxide, carbon dioxide, methane, and hydrogen (O2 / CO / CO2 / CH4 / H2). We can apply the measurement / correction methodology to accurately measure H2 in these five-gas mixtures. A gas analyzer equipped in this manner will therefore have an accurate reading for H2 and for each of the other four gases. In some cases, the sample is comprised of a simple mixture of hydrogen and one other gas such as nitrogen (N2), air, CO2, etc. A binary mixture will not have the same interference problems that the complex mixtures have. We can treat this situation as shown below. When the non-H2 gas comprises 100% of the mixture, the H2 reading is 0%. Conversely, when the H2 gas comprises 100% of the mixture, the non-H2 reading is 0%. The region in the middle of the graph represents various mixtures of the two gases. This region may not be inherently linear. However, our technicians have developed a detector configuration and production process over the years that linearizes this condition and allows accurate measurement of hydrogen in many gases. Our capability for trace H2 analysis is limited to ppm (parts per million) ranges using electrochemical sensors. As with most electrochemical H2 sensors, ours are sensitive to the presence of CO. This generally precludes their use in applications that produce CO, such as combustion processes. Even in non-CO mixtures, our general opinion is that these sensors are best suited for spike detection only, and not for process control. We can provide a choice of ranges such as 0-200 / 500 / 1000 / 2000 PPM H2. For hydrogen purity for power generation applications, see our 380K Tri-Gas Analyzer and specialized solutions.